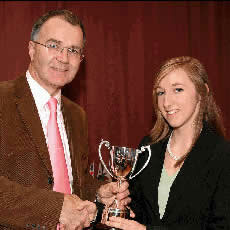 Congratulations to BISC ice dancer Tamsyn Pack on being honoured in the 2004 Wokingham Sports Awards. Tamsyn, 14, was nominated for the Junior Ladies Award by Barkham Parish Council’s Sporting Endeavour Fund which last summer granted her and fellow ice dancer Hayley Salmon £100 each towards their training costs. Tamsyn’s award recognised her success as a solo ice dancer and with her partner, Richard Boaden. Having won bronze in the British Primary Ice Dance Championships in 2003, they were selected for the British Junior Development Squad last spring and went on to come 2nd in an international in Italy. Tamsyn subsequently qualified for the British Junior Solo Ice Dance Championship last July, by winning the qualifying event at the Bracknell Open, and was expected to win a championship medal but had to withdraw because of injury. She went on to win the Junior Scottish title and came 3rd with Richard in two championship qualifying events. She received her Wokingham award -a pair of crystal glasses to keep and a cup -at a presentation evening attended by civic dignitaries at the Berkshire Masonic Centre in Sindlesham on February 10. Just three dancers turned up for the first session of the club’s new ice dance club on February 16. Despite it being during halfterm, not one child went along and there were no visitors from other rinks. The dance club, held from 9.15-10.30pm on the third Wednesday of the month, began with a half-hour lesson by Wendy Day who showed the keen dancers how to improve basic dance moves. The rest of the session was devoted to a series of compulsory dances. It is hoped that news of the club will spread and that many more skaters will attend the next session on March 16. Copyright © 2010 Bracknell Ice Skating Club, John Nike Way, Amen Corner, Bracknell, Berkshire RG12 8TN. All Rights Reserved.